Here at WhiteTree Fabrics, we have a very broad selection of lace fabrics in many different styles and colours, with the number of lace products we have in stock numbering over 700. One of our many types of lace is stretch lace. Stretch lase is a very flexible type of lace to work with, and is very versatile to use in the crafting of various clothing. Our stretch less comes in variants of either one way or two stretch, and in over 120 different pattern varieties. 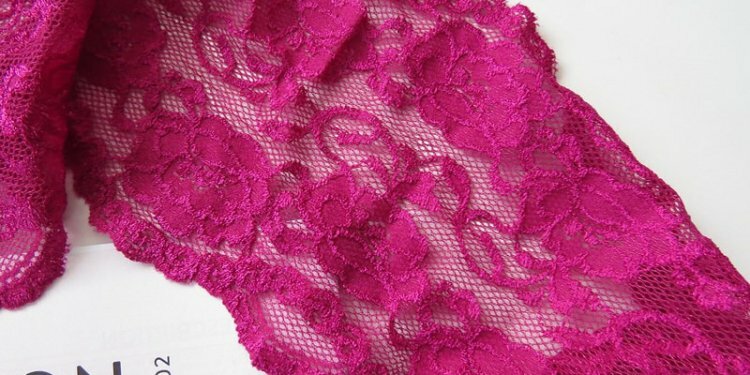 There are a wide variety of uses for stretch lace, including lingerie, tanks, dresses, skirts, fashion accents home furnishing to name a few. Use your imagination, and we are confident that you will be able to create something you are proud of from our excellent range. View our extensive fabric collection and choose from over 1600 designs, in varying patterns and colours. If there's something you're looking for that you can't seem to find, then please contact us. Chances are we can get it and we would much rather stock the lovely things that you want to buy so that our shop offers the best selection possible.